Bluebird Garden [C7271] - $10.00 : Yarn Tree, Your wholesale source for cross stitch supplies. Cross stitch pattern by Artful Offerings. 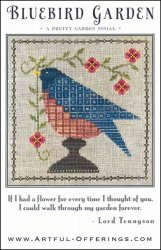 "Bluebird Garden," features a beautiful bluebird stitched in the middle of the design. The bird is holding a stem of flowers in it's beak. Stitch count 98 wide x 103 High.